When we talk about football fans, we think about the fans that travel up and down the country watching their team play home and away with relative ease. 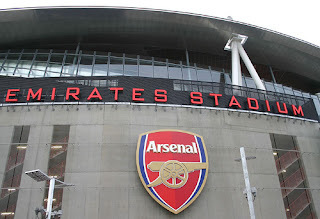 The financial side of going to football matches hurt most supporters’ during a season as money can be tight but apart from the financial constraints, there are relatively few issues that I personally find that stops me watching my beloved Arsenal team play home and away. There is a section of supporters that find it much trickier but still do what everyone else does. The disable community at Arsenal and in football generally is massive. I want to take the next few minutes to give them the credit they well and truly deserve. Home or away, sunshine or in rain, they are there. The uncomfortable journey that may occur is not an issue for these supporters and they do not complain nor really care because they want to just support and watch their team play (even though for some travelling is very difficult). I always see these fans turning up and supporting their team every time I go to a football match (club or Country). The section around the ground at the Emirates which seats wheelchairs is always full of enthusiastic football supporters. I often like to talk to them and listen out for their experiences at other grounds and issues they may have had and some of the stories I have heard are incredible; yet they keep coming back and that is a credit to them and football in general. I know a few purple members and I often meet up with a few before games to have a chat; I have a cousin who is a season ticket holder who was previously a purple member too so I know a lot of about the Season tickets/purple membership. Purple members put in applications for their tickets and the disability team distribute the tickets. The away tickets work on points like it does with everyone else but travelling up and down the country takes more effort as some people cannot just jump on a train to get to a ground. Some will need to plan much in advance and get someone to drive them along with finding a parking place which is relevantly close to the ground. I know some that have to pay extraordinary rates for accessible taxis to bring them to games then have to wait a while after games for the taxis to come and pick them up again. (If that is you, then contact your disable ticketing team who can give you a few mini cabs numbers of accessible taxis that the club may have links with). With the current climate and the recent poor form yet at Arsenal; the support has remained at its best home and certainly away. The Disable community are a massive part of that and sometimes taken for granted. They deserve credit from all football supporters all over the world as Arsenal is not the only club where the disable community is huge; most clubs across the country and abroad have many communities like this that travel across the country (and world) to watch their team play. Things like this are what makes football so unique and what makes Arsenal football so special.